Let's make the Heavenly Miracle Romance Sailor Moon Parfait! In honor of the 24th anniversary of Sailor Moon, a cafe/art exhibition opened in Tokyo called Chibiusa Cafe. At the cafe, they have a unique customized menu featuring items resembling characters from the series. One of the items, the Heavenly Miracle Romance Parfait, is what we will be recreating today on Yatta-Tachi Noms. 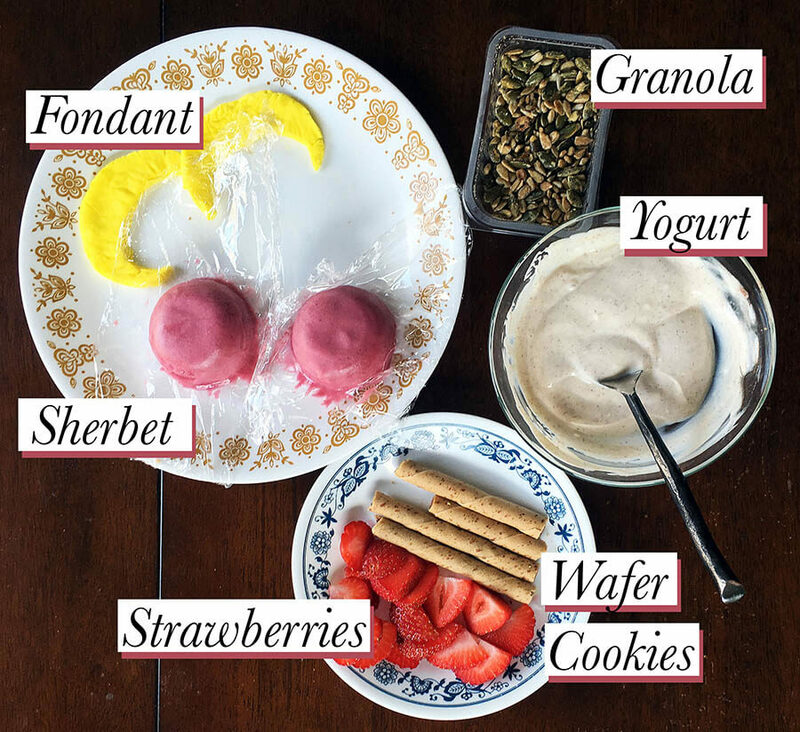 This yummy, sugary Sailor Moon Parfait consists of several layers of jello, yogurt, granola, fresh strawberries, raspberry sherbet, wafer cookies and a crescent shaped fondant moon. This Sailor Moon Parfait recipe is definitely one you want to make ahead and assemble right before serving. With the amount of jello called for in the recipe, it will make two parfaits. In a small bowl, take half a packet (~1.5 oz) of the red Jello. Follow the instructions listed on the package and fill ⅕ of the parfait cup with the Jello mixture. Place the parfait cup in the fridge and let it set in there for 1.5 hrs. Repeat the process for the next 3 colors in this order: yellow, pink/purple, and then finally blue. Be sure to let the Jello set for 1-1.5 hrs each time you add a new layer or they might start to blend together. Make sure to leave about ⅕ of room on top for the rest of the toppings. While the final Jello layer is setting, take your sherbet out of the freezer and set it out on the counter to thaw/soften. Roll out your yellow fondant and with a knife, carefully cut out a crescent moon. Chill in the fridge. Once the sherbet is soft enough, scoop it into a sphere mold or a round-bottomed cup with the same width as the opening of the parfait cup. Pack it down and freeze the mold/cup. Remember to assemble the parfait right before you’re ready to serve. When ready, cut up the strawberries lengthwise. Grab your now completely set Jello filled parfait cups. Take your sliced strawberries and press them against the inside of the glass. Spoon 2 tablespoons of yogurt into the cups, covering up the strawberries. Sprinkle ½ tablespoon of granola on top of the yogurt and press it down with a spoon to make room for the sherbet. Take the sherbet out of the sphere mold and cut it in half. Take one of the halves and place it on top of the yogurt/granola. Grab your wafer cookies and push them into the yogurt to fan behind the sherbet. Retrieve your crescent fondant and place it between the sherbet and wafer cookies so it can be propped up. Add a few pearl or star shaped sprinkles on top of the sherbet and you’re done! Be sure to serve immediately. There are a couple of things to point out that I should have realized before I started to assemble my parfait. I didn’t take into consideration that the wafer cookies I got were too wide to fit behind the sherbet, which caused the sherbet to sink rather awkwardly into the cup. My fondant started to wilt from the warm temperature of the room (curses Texas sun! ), so that’s why in the final picture, my moons were looking a tad sad. Overall, for a first attempt, I can say my version of the Sailor Moon Parfait was fairly successful despite a few setbacks. I hope you can learn from my mistakes! If you have any questions, feel free to ask them in the comment section.You can see the rest of the menu items available at Chibiusa Cafe by reading Rocket New 24’s article! What should we make next on Yatta-Tachi Noms? Disclaimer: Yatta-Tachi may receive a small commission from the Amazon links. You should try somethin from shokugueki no soma! The frozen fried eggs look weird and amazing!